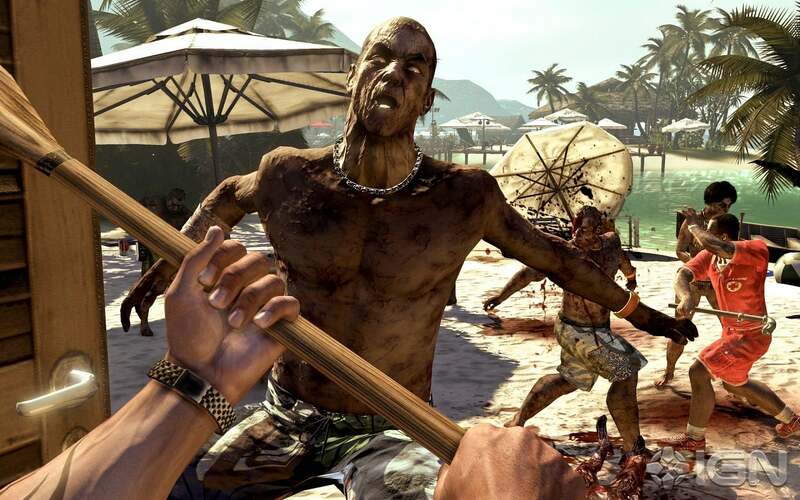 Dead Island is a first-person survival horror developed by Techland and published by Deep Silver for Microsoft Windows, PlayStation 3 and Xbox 360. It is centered on the challenge of surviving a zombie-infested open world island with a major emphasis on melee combat. It was originally announced at E3 2006,but was pushed back to 2011. It was released on September 6, 2011 in North America and September 9, 2011 for PAL regions (excluding Germany). 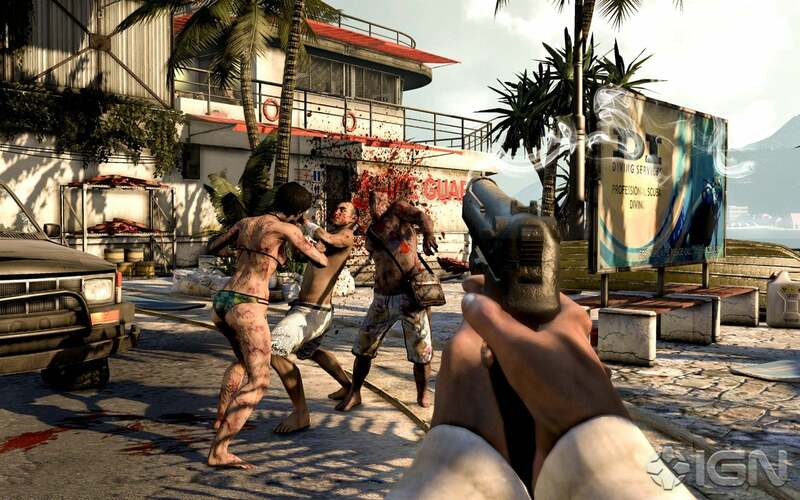 Dead Island features open world roaming, played from a first-person perspective. Most of the gameplay is built around combat and completing quests. 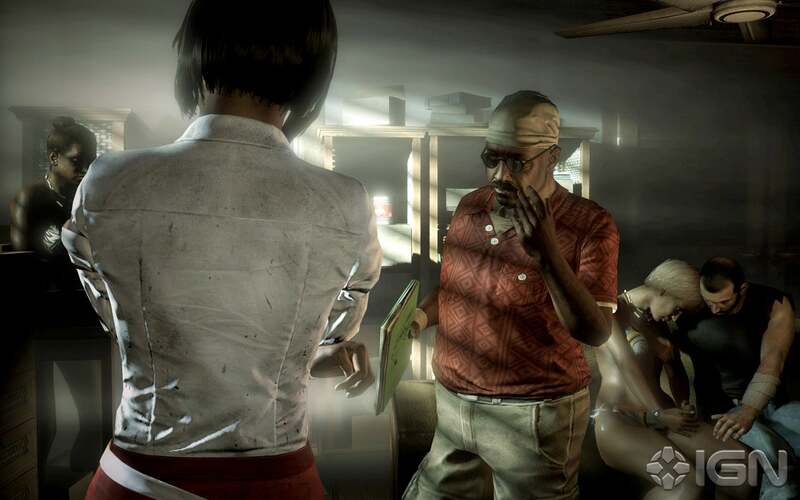 Dead Island is a role-playing game and uses experience-based gameplay and character customization. The player earns XP by completing tasks and killing enemies. Upon leveling up, the player gains health and stamina, and can invest one skill point into a skill tree. Combat is carried out through the use of melee weapons and firearms. Melee weapons are emphasized to the point that firearms are not available for the first quarter of the game, and consist of blunt and bladed weapons. Weapons are randomly generated and positioned in predetermined locations as well as found on some enemies; they have unique stats which are generally based on the player's current level. Each weapon can be upgraded four times to increase its stats, and most weapons can be "modded" - customized based on a blueprint to add special features, such as nails or electrified blades. There is also a stamina bar, meaning that after a set amount of physical action, such as running, jumping, or swinging a weapon, the character needs to stop to regain his or her stamina before continuing to attack. 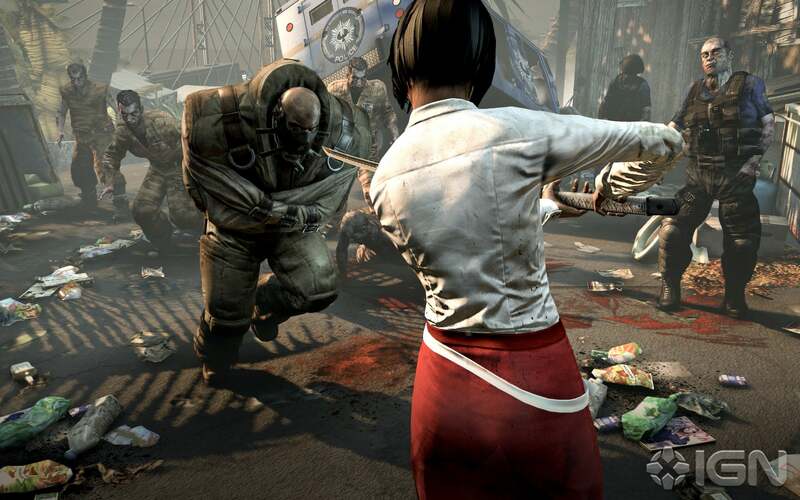 The game features "special class" zombies, which are more powerful than the standard zombie.Players need to use flashlights in dark areas and during night-time sections, adding suspense. Zombies in the game have different abilities, such as the Infected being 28 Days Later style running zombies, and Walkers being Romero style zombies. There is also the Thug, an above average height zombie with enhanced strength, the Suicider, a self aware zombie who pleads with the player to kill it, and then explodes to damage surrounding enemies, and a Ram, a large Zombie wearing a straightjacket who charges at the player. The final zombie types are the Butcher, who is a zombie with its hands chewed off; using the sharpened bones as knives, and the Floater, a bloated zombie who vomits flammable acid-like vomit onto the player. 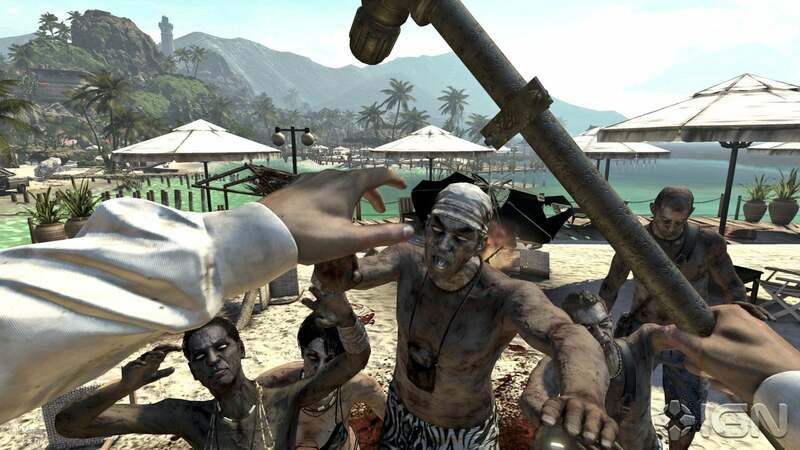 Dead Island takes place on the fictional island of Banoi, located off the coast of Papua New Guinea, the home of a large tropical resort hotel. The night after a high-profile party, the four main characters—rapper Sam B., hotel desk clerk and spy for the Chinese government Xian Mei, former football star Logan, and bodyguard Purna—are awakened by a voice over the emergency intercom system directing them to evacuate the hotel. They discover that much of the population of the island have been taken by a contagious infection that has turned them into zombie-like creatures. Briefly overcome by the infected, they are rescued by lifeguard John Sinamoi and James Stein, who believes them to be immune to the infection. Upon the survivors waking up in a hut, they help a besieged Sinamoi. After aiding Sinamoi and several other guests he rescued to reach a secure lifeguard station and call for help, Sinamoi requests they travel to the nearby city of Moresby to obtain food and supplies while they await rescue. After assistIng survivors, they meet the other lifeguard, James Stein, who helped them earlier. In return for aiding his group, he gives the survivors equipment for their radio. Sinamoi soon decides to have the survivors take an armored car from the hotel's garage. The four then travel to a nearby auto garage where they meet Earl, the owner, who has recently been bitten by the infected. He maintains his humanity long enough to create an armored vehicle that will allow them to safely reach the city, and requests that they take his adopted daughter, Jin, along to prevent him from attacking her once he turns. 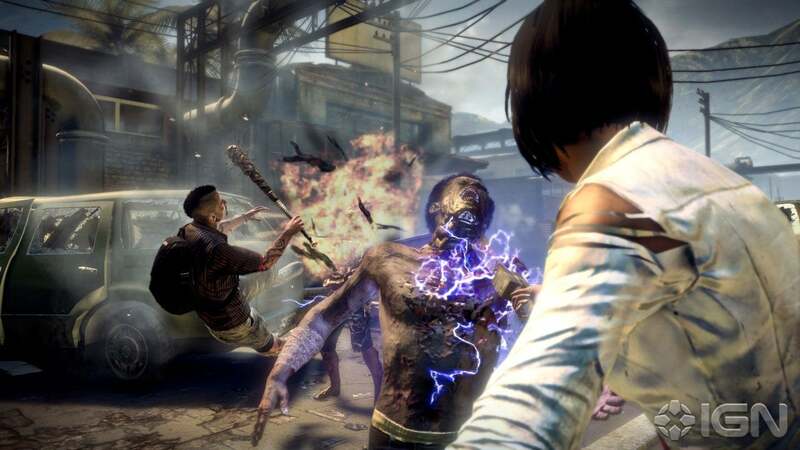 A promotional still featuring Xian Mei, one of the four playable characters, about to attack oncoming zombies. The still shows this in third person, while the game uses a first-person perspective. Upon arriving in Moresby, they discover a horde of infected attempting to break into a barricaded church where another group of survivors is hiding. After the four kill the infected, the church survivors inform them that while much of the city has been overrun, a violent street gang has secured the police headquarters. The church group's leader, Mother Helen, requests that the four help restore the church's water supply by repairing fire hydrants and entering the sewers and reactivating the neighborhood's pump system. After doing so, the group travels through the sewer tunnels to reach city hall, where several of the island's top politicians, along with the mayor of Moresby, have holed up, but they refuse to assist the other survivors in any way. The main characters attempt to regroup to decide their next plan, which is to supply survivors with supplies raided from the supermarket guarded by gangs, and when they return to city hall, they find it has been overrun with infected, which were able to enter the building through the tunnels after the four drained the reservoir by activating the church's water pump. They return to the church and learn that Jin attempted to help the gang at the police station but was kidnapped, and they are focused to mount a rescue for her. After infiltrating the police station, they kill the gang members and rescue Jin, who has been implied (later confirmed in the novelization) to have been raped. After acquiring supplies, the main characters return to the hotel, where the voice contacts them again. The voice identifies himself as Colonel Ryder White, a Banoi Island Defense Force (BIDF) commander, currently trapped in a prison located on Banoi, accessible only through the jungle. He states that due to the characters' immunity, he may be able to obtain an anti-virus to cure his wife of the infection. The group assists a small survivor encampment in the jungle and meet Mowen. Mowen does not know how to get to the prison, but instead takes the players to the location of a secure bio-research facility on the island; the researchers there have been examining a native cannibalistic tribe where they believe the infection may have started from. They affirm that the characters' blood type helps to make them immune to the infection, but at the same time, realize that an anti-virus cannot be created. Under direction by the scientists, the group rescues a native woman, Yerema, who was about to be sacrificed by the tribe. She willingly returns with the group to the laboratory to allow herself to be examined. After completing tasks for Mowen and returning Jin to her home to put down her infected father, the characters return to the laboratory and find that the infected test subjects had been accidentally released and the scientists wiped out. They rescue Yerema and recover the sample of vaccine that had been created. With Yerema's help, the group, Mowen, and Jin travel to the prison to meet with White. They find that a number of prisoners have survived the infection, and are given their aid in arming themselves to get to White. When they reach an elevator to travel to White, the elevator is suddenly filled with knockout gas. The characters are awoken by Kevin, a technology-savvy prisoner, who reveals that White has stolen the vaccine and is attempting to flee, while readying to detonate a nuclear explosive to wipe out the island. The group races to the roof and confront White, who refuses to hand over the vaccine. Jin releases White's wife from a restraining harness, forcing White to defend himself. His wife bites him, infecting him, and he shoots both her and Jin before taking the vaccine. However, the vaccine's formula is flawed, and White becomes an inhuman monster, and the group is forced to kill him. The group escapes Banoi in White's helicopter along with Yerema and Kevin, and as they travel to Sydney, ponder the fate of the world. On July 18, 2006, in a classified location two weeks before the outbreak, Ryder White, a colonel in the Australian Defense Force, is being interviewed by his commanding officer. He was presented with targets which he was asked if he would kill without question (one of which was his wife, Emily White, which he agreed to reluctantly). Behind a one way mirror, two observers discuss Ryder's answer. After passing the test, Ryder was deployed on Banoi in order to aid with containing the recent infection outbreak. During the mission, Ryder and his squad on board of a helicopter were ordered to initiate a bombing run on the highway in the jungle. During their flight back to the base, the co-pilot of the aircraft became infected and attacked the other pilot, forcing the craft to crash land in Moresby. Ryder awakens from the crash several hours later to find himself the only survivor among his crew. He is then contacted by the B.I.D.F. who instruct him to regroup with Unit 4 stationed near Saint Christopher's Church. Ryder arrives at the unit's location to discover that everyone had been killed by the Raskols before being stripped of their weapons and equipment, which included the explosive charges needed to destroy the City Bridge in Sector 4 (Old Town) used to prevent the infection from spreading any further. He is then informed by the B.I.D.F. to make his way to the Police Station in Sector 3 of the city in order to recover the explosives to complete Unit 4's mission. After fighting his way to the Police Station, Ryder is confronted by members of the gang who taunt him over the loss of his fellow soldiers. After a heated firefight, Ryder managed to kill the gang members and collected the stolen equipment before being instructed to proceed with finding and destroying the bridge. With most of the roadways blocked, Ryder climbed into a manhole that took him to the sewers beneath Moresby in order to gain access to the riverside. Upon exiting the sewers, Ryder's progress is again faltered by the Raskols gang and claim the City Bridge as their territory; leaving him with no other option but to kill them. Later, Ryder proceeded placed charges on the bridge and set it to explode. With the mission a success, the B.I.D.F. intel ordered Ryder to make his way to the evacuation zone in Sector 6 (Gas Station). Ryder then fought through waves of Infected as he waited for the evac chopper to arrive. While on board the chopper, Ryder contacted Emily telling her to prepare herself to be picked up. Emily however, replied that she had been bitten and told Ryder to go on without her before making her tearful farewell to him. Unable to accept the loss of his wife, Ryder ordered the pilot not to land on the aircraft carrier off the coast of the island and instead change course to the Prison in order to pick up his wife. The chopper then landed on the roof of the prison where Ryder ran his way inside to find Emily in hopes of not being too late. When Ryder reaches Emily in the hospital wing of the prison, he finds her strapped to a bed trying to tell him to leave her in broken English as a result of the gradual transformation into an Infected. Ryder then travels deeper into the prison in order to find Kevin. Upon discovering Kevin, he discovers that Kevin is actually the terrorist, Charon. Ryder was then left with no other choice but to collaborate with Charon in order to ensure his wife's life. Charon instructed Ryder to active the prison's emergency power in order to activate the complex's surveillance cameras which Charon would then use to guide Ryder. Once the power was back online, Ryder was confronted by a groups of rebel prisoners that managed to obtain firearms from the prison's armory. After fighting through numerous groups of prisoners, Ryder arrived at one of the other medical wards in the hospital where he found an antibiotic, Tetracycline, to slow the effects of the Infection on Emily. Once Ryder obtained the antibiotic, Charon informed him that the Heroes were on their way to the island with the antidote and that the antibiotic would slow down the effects of the Infection on Emily until they arrived. After administering the antibiotic to Emily, Charon notifies him that a group of prisoners were approaching in retaliation for the ones that Ryder killed in order to obtain the Tetracycline. With the prisoners dead, Ryder traveled to the control room in Block C and met up with Charon. As Ryder approaches Charon, he discovers that Charon was behind the deaths of the scientists, including Dr. West, at the Laboratory but hides his suspicion. He is then instructed to clear the Infected from the shower room in Block C for when the Heroes arrive. With the shower room cleared, Ryder used the sewers in order to return to the control. While eavesdropping on Charon's conversation with the group(the main characters), he discovers that Charon has been posing as him (The Voice). Out of rage, Ryder threatens to kill Charon for endangering Emily and making him betray his country. Charon then ensures him that the group have the 'antidote' and that the Heroes won't trust either Ryder or Charon if it is revealed that they were never actually speaking to Ryder. Charon then instructs Ryder to store knockout gas above the elevator lift that the group will be using in order to steal the antidote from them to avoid having to make any negotiations. After placing the gas and returning to the control room, Charon and Ryder watch the Heroes pass out from the gas. Before leaving to retrieve the gas, Ryder destroys the control room's computer in order to prevent Charon from pulling off anymore tricks. He then locks Charon in the control room and tells him that he's going to go get the antidote for Emily. Charon then replied to Ryder stating that the antidote would only work on people that were only in the early stages of Infection while Emily was already past the first stages. Shaken by his words, Ryder ran off to get back to Emily in the intensive care unit. With Ryder gone, Charon reveals that he had a hidden backup key card and taunts him stating that Ryder should have killed him when he had the chance. Afraid of being too late, Ryder collected the antidote from the group and frantically fought through countless waves of Zombies to get back to Emily. Upon finding Emily, she has already become an Infected. Ryder then vows to make a complete antidote out of the serum and brings Emily to the roof where he discovers that Charon had turned the group against him. Jin then releases Emily to attack Ryder, forcing him to kill her and Jin in retaliation. He then injects himself with the antidote only to discover that the antidote was actually an enhanced version of the virus that transforms him into a powerful Special Infected. He is then killed by the group who fled to safety on Ryder's chopper afterwards. It is reveal that Charon plans on using Yerema as Dr. West called, "a ticking timebomb" to spread the Infection, as he shows a smirk on his face. The Bloodbath Arena DLC includes a survival mode where players, either single player or co-op mode, must endure hordes and hordes of zombies until their death(s). The pack includes four different arenas to choose from featuring endless waves of the undead. The player may gain experience points and loot that can be carried over into their story mode. Those who achieve high, record scores will be featured on the Xbox Live Leaderboard. The pack also features a new weapon, the Sonic Pulse Grenade as well as a special weapon, the Ripper. The Ripper is a combination of the Baseball Bat and buzz saw that "leaves attacking zombies battered and bleeding to death." ALREADY INCLUDED IN MAIN PACKAGE. Ryder White's Campaign, also known as Dead Island: Ryder White, is a downloadable campaign for Dead Island that was released on January 31, 2012 for PlayStation 3, Xbox 360 and Windows PC. It is available for 800 Microsoft points on Xbox LIVE Marketplace or for EUR 9,99 on PSN and Steam. Ryder White's campaign focuses on his role as a soldier to contain the infection in Banoi and his efforts to find a cure for his wife, Emily White.